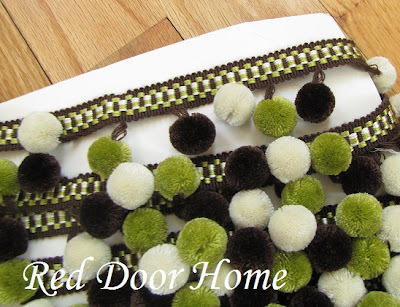 One of the simplest ways to dress up curtains is to add decorative trim. Trim takes curtains from run of the mill to stylish in very little time and with such a wide range of colors, price points and varieties, finding trim to match your style is a breeze. 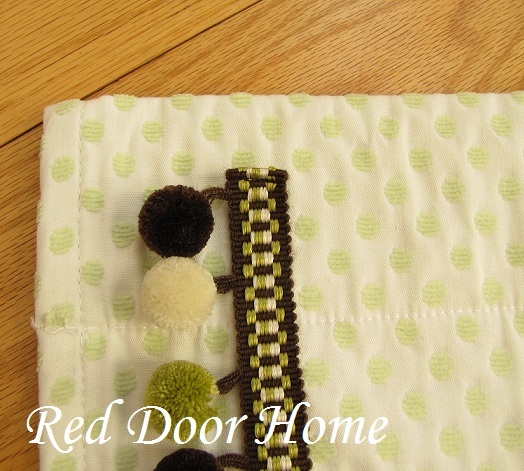 Typically when I add trim to curtains it is on the leading edge (meaning the inside edge) or edges (meaning inside and outside edges) of the panel. Sometimes it is placed right up to the edge and other times it is placed with space between the trim and the edge. The choice is really up to you. For this tutorial I will be focusing on how to add decorative trim to the inside/outside edge of a curtain panel although it can be placed on the top and/or bottom as well. To determine the total amount of trim needed, measure the edge of the curtain panel, add 2 inches and then multiply by the number of panels. Keep in mind, if you are using trim with a pattern (i.e. 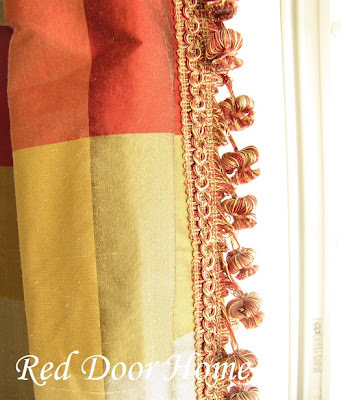 alternating colored fringe like the picture shown above) you will need to start and end your fringe at the same point on each curtain which may mean you will need additional yardage. 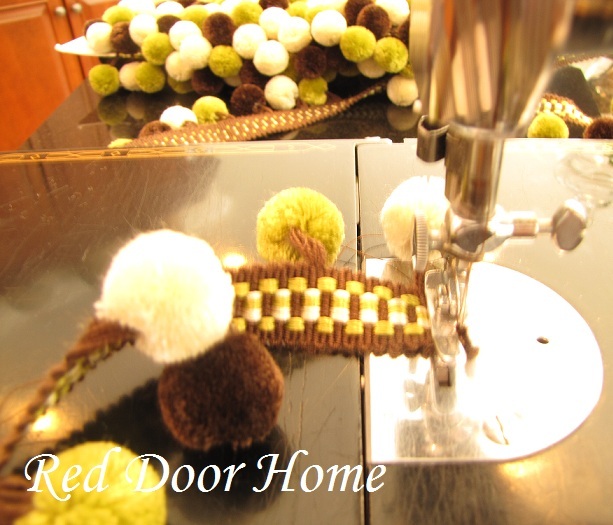 To keep the trim from unraveling, fold over top end and secure with sewing machine using matching thread. 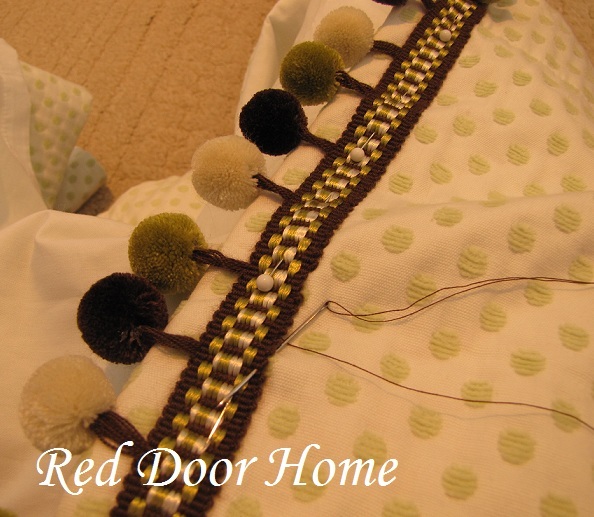 Start at the top of the curtain and pin trim along edge in desired location. For this example I left about a 1/2 inch between the edge of the panel and the beginning of the trim. 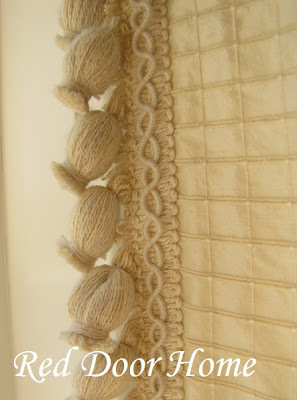 Once you have reached the bottom edge of the curtain, cut trim about a half inch below where you want the trim to end. Fold over and secure with sewing machine so the trim is the correct length for the panel. Although some people use glue and others a sewing machine, I like to secure trim by hand with a needle and thread. One advantage of using this method (if your curtains are lined) is the thread used to attach the trim will not be visible on the back of the curtain like it would be if you use a sewing machine. Also, if you later change your mind and want to remove the trim, unlike glue or machine stitching, hand sewing can be easily removed without ruining the curtain panel. To hand sew the trim, simply start at the top and slip stitch around all four sides of the trim – top, bottom, right and left. Make sure you stitch through the trim and the face fabric of your curtain but not through the curtain lining. Here are a few examples of curtain panels with trim. 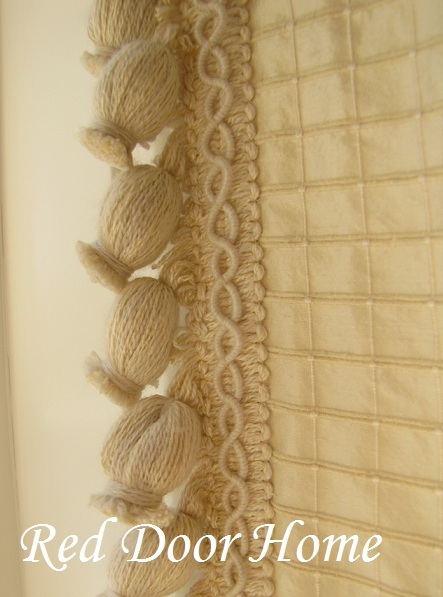 The first picture shows a close up of the onion fringe on the curtains in my living room. My bedroom curtains are edged with tassel fringe. 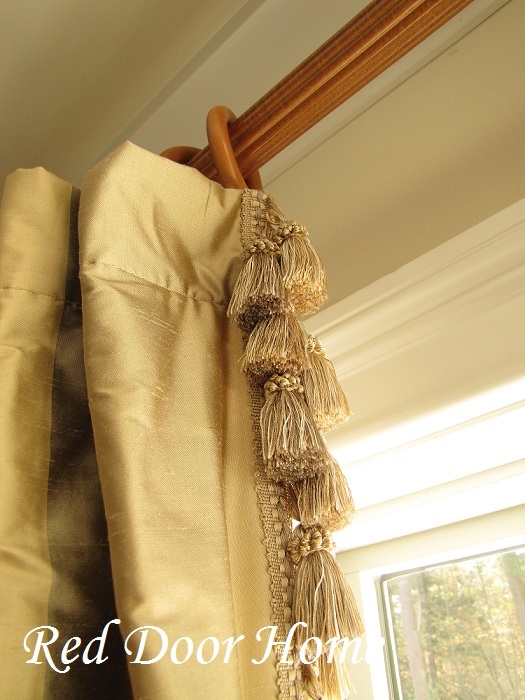 The curtains in my office are a tone-on tone-design – ivory silk with matching ivory trim. If you have not done so already, I hope you will give this simple project a try. 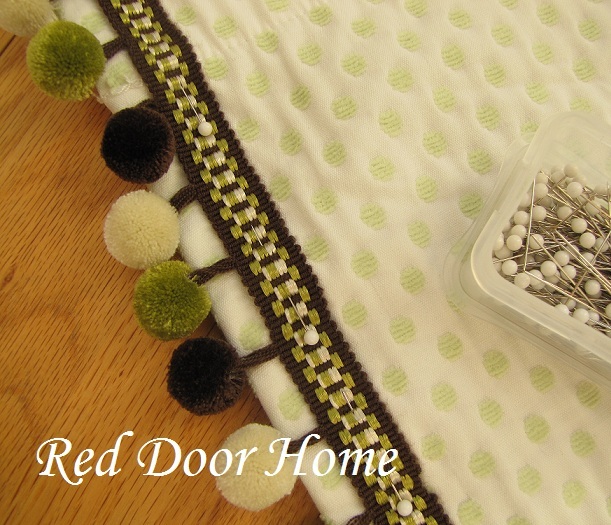 It is such an easy and inexpensive way to add dressmaker details to curtains. Thanks Stacy! What a nice little touch! That's a great idea, Stacy! You've used some beautiful trims on your drapery. Now I have to go look at my drapes and see what I can do to them! Thanks for that tip. I was toying with using ribbon as a trim to my basic white panels. Thanks for your clear photos on 'how to' add trim to curtain panels. I've been eyeing the trims at Calico Corners. They are so beautiful, but not in my budget! My Jo-Ann store is pretty slim pickin, but I love that i can use a coupon. Do you have a favorite place to buy your trim? 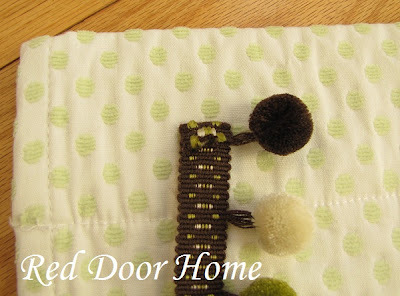 Great idea to hand stitch it. I just iron some ribbon on recently to some panels but I was not worried about reusing them as I just used drop cloths. But it really does add a little something. Trim really adds the finishing touch to panels. I could look at trim for hours. There are so many pretty ones out there. I just wish it weren't so expensive! If you have a source that is discounted, I'd love it if you could share it with us. I love trim on the leading edge, and on drapery in general. I love the green/brown combo you did. Ball fringe has always been a first love of mine in that department, I just adore the fun texture of it. Great tips, great post. My Dining Room Mirror has Arrived! Should you take it with you?